The teaching materials for the learning experience on “The Restoration” are divided into three parts. In Part 2, students will study paragraph 4.4 in the Doctrinal Mastery Core Document. They will also study Doctrine and Covenants 1:30. This lesson includes a practice exercise that will help students apply the doctrine they learn. Note: You could teach the “Understanding the Doctrine” segment and the practice exercise in this lesson in a single class session or in two separate class sessions. If you choose to teach the segments over the course of two class sessions, you may need to briefly review with students what they learned in previous segments before you teach a new segment. Write the words True and Living on the board. Invite students to think of synonyms for each of these words. Ask a student to act as scribe and list students’ responses on the board. Consider inviting students to create a sentence that uses both of these words. Explain that during this lesson they will study how the words true and living describe The Church of Jesus Christ of Latter-day Saints. Point out that some people take offense when we claim that our Church is the only true Church of Jesus Christ. As they learn about the Restoration today, invite students to look for why we believe that The Church of Jesus Christ of Latter-day Saints is the only true and living church on the earth. Invite a student to read aloud paragraph 4.4 in the Doctrinal Mastery Core Document. Ask the class to follow along, looking for the key statement of doctrine that explains why we believe that our Church is the true and living church of Jesus Christ. Invite students to report what they find. 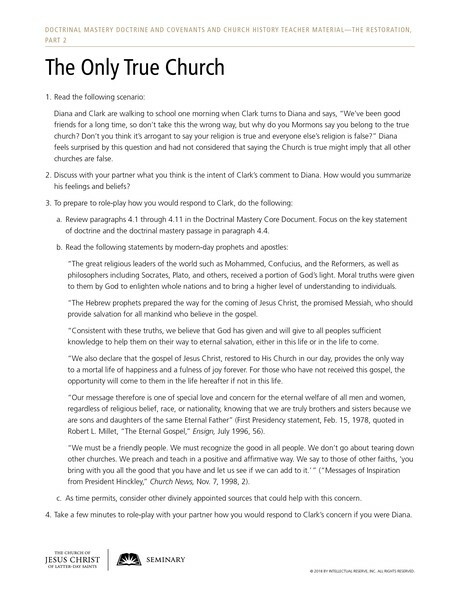 Students should identify the following key statement: Because it was established by God Himself, The Church of Jesus Christ of Latter-day Saints is “the only true and living church upon the face of the whole earth.” Invite students to mark this statement in their copies of the Doctrinal Mastery Core Document. Explain that Doctrine and Covenants 1 is the Lord’s preface to the Doctrine and Covenants as revealed to the Prophet Joseph Smith in this dispensation. In this revelation the Lord addressed all of Heavenly Father’s children around the world as a “voice of warning” (see D&C 1:4). Invite a student to read Doctrine and Covenants 1:30 aloud. Ask the class to follow along, looking for the portion of the key statement of doctrine in paragraph 4.4 that is taught by this doctrinal mastery passage. Invite students to share what they find. To help students understand how we should think of the phrase “true and living church,” invite a student to read aloud the following statement by President Dallin H. Oaks of the First Presidency. Ask the class to listen for what President Oaks said about what the phrase “true and living church” means. “Because of this declaration of the Lord, we refer to this, His Church—our Church—as the ‘only true Church.’ Sometimes we do this in a way that gives great offense to people who belong to other churches or who subscribe to other philosophies. But God has not taught us anything that should cause us to feel superior to other people. Certainly all churches and philosophies have elements of truth in them, some more than others. Certainly God loves all of His children. And certainly His gospel plan is for all of His children, all according to His own timetable. “So what does it mean that The Church of Jesus Christ of Latter-day Saints is the only true Church? “… This Church is ‘living’ because we have prophets who continue to give us the word of the Lord that is needed for our time” (Dallin H. Oaks, “The Only True and Living Church,” New Era, Aug. 2011, 3, 5). What does the key statement of doctrine in paragraph 4.4 teach us about how The Church of Jesus Christ of Latter-day Saints is the only true and living Church upon the earth? Give students a few minutes to ponder how they have been blessed by being a member of the “only true and living church.” (If time allows, you may want to invite students to record their thoughts in their class notebooks or study journals.) Consider inviting a few students to share their feelings with the class. Review with students paragraphs 13 through 17, “Helping Others Acquire Spiritual Knowledge,” in the “Acquiring Spiritual Knowledge” section in the Doctrinal Mastery Core Document. Divide students into pairs, and provide each student with a copy of the accompanying handout. Invite students to work together in their pairs and follow the instructions on the handout. Diana and Clark are walking to school one morning when Clark turns to Diana and says, “We’ve been good friends for a long time, so don’t take this the wrong way, but why do you Mormons say you belong to the true church? Don’t you think it’s arrogant to say your religion is true and everyone else’s religion is false?” Diana feels surprised by this question and had not considered that saying the Church is true might imply that all other churches are false. Discuss with your partner what you think is the intent of Clark’s comment to Diana. How would you summarize his feelings and beliefs? Review paragraphs 4.1 through 4.11 in the Doctrinal Mastery Core Document. Focus on the key statement of doctrine and the doctrinal mastery passage in paragraph 4.4. “The great religious leaders of the world such as Mohammed, Confucius, and the Reformers, as well as philosophers including Socrates, Plato, and others, received a portion of God’s light. Moral truths were given to them by God to enlighten whole nations and to bring a higher level of understanding to individuals. “The Hebrew prophets prepared the way for the coming of Jesus Christ, the promised Messiah, who should provide salvation for all mankind who believe in the gospel. “Consistent with these truths, we believe that God has given and will give to all peoples sufficient knowledge to help them on their way to eternal salvation, either in this life or in the life to come. “We also declare that the gospel of Jesus Christ, restored to His Church in our day, provides the only way to a mortal life of happiness and a fulness of joy forever. For those who have not received this gospel, the opportunity will come to them in the life hereafter if not in this life. “Our message therefore is one of special love and concern for the eternal welfare of all men and women, regardless of religious belief, race, or nationality, knowing that we are truly brothers and sisters because we are sons and daughters of the same Eternal Father” (First Presidency statement, Feb. 15, 1978, quoted in Robert L. Millet, “The Eternal Gospel,” Ensign, July 1996, 56). “We must be a friendly people. We must recognize the good in all people. We don’t go about tearing down other churches. We preach and teach in a positive and affirmative way. We say to those of other faiths, ‘you bring with you all the good that you have and let us see if we can add to it.’” (“Messages of Inspiration from President Hinckley,” Church News, Nov. 7, 1998, 2). As time permits, consider other divinely appointed sources that could help with this concern. Take a few minutes to role-play with your partner how you would respond to Clark’s concern if you were Diana. After sufficient time, invite a few students to share what went well, and what, if anything, was difficult in responding to this concern. Conclude with your testimony that The Church of Jesus Christ of Latter-day Saints is God’s true and living church on the earth today. The following review activities are not intended to be taught during the same class session as this lesson—“The Restoration, Part 2.” Please present these activities during seminary class sessions that take place after you have taught this lesson, but before you teach “The Restoration, Part 3.” These short reviews can be taught at the beginning or end of classes in which you teach regular sequential scripture lessons from the Doctrine and Covenants. Be sure that these reviews take no longer than the allotted time, so as not to take away from the scripture block students will be studying in class. Invite a student to read the key statement of doctrine aloud. Ask students to find the doctrinal mastery passage in the Doctrine and Covenants that helps teach this truth. Once all of the students have located Doctrine and Covenants 1:30, invite students to read the passage aloud as a class and consider how this passage helps teach the key statement of doctrine on the board. Invite students to report what they find. Write the following doctrinal mastery passages on the board. Assign each student a number—1, 2, or 3. Give students two minutes to review the passage associated with their number and to study the associated key statement of doctrine from the Doctrinal Mastery Core Document. Why did God the Father and His Son, Jesus Christ, appear to Joseph Smith? What did Joseph Smith translate? Which key statement of doctrine helps us understand why The Church of Jesus Christ of Latter-day Saints is “the only true and living church upon the face of the earth”? Which passage describes Joseph Smith as a prophet? What can be shown as evidence that Joseph Smith was a prophet of God? Which passage tells about the translation of the Book of Mormon? Which passage teaches about a part of the Restoration?